BIC Xtra-Precision Mechanical Pencils, 24-Count - Only $3.15 Shipped! BIC Xtra-Precision Mechanical Pencils, 24-Count – Only $3.15 Shipped! 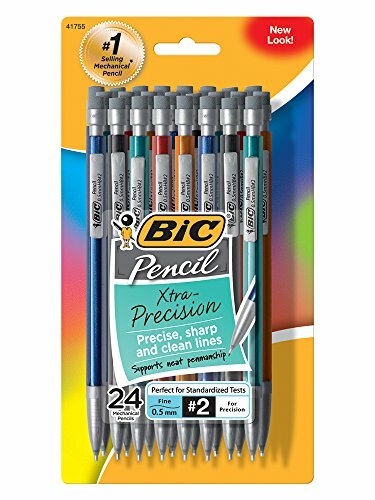 Score a GREAT DEAL on the BIC Xtra-Precision Mechanical Pencils, Metallic Barrel, Fine Point (0.5mm), 24-Count today for only $3.15 from Amazon! You will get FREE Shipping if you are a Prime member! If you are not an Amazon Prime member you can grab a FREE 30-Day Trial HERE! Get the all the Details of this deal below! Pay only $3.15 with free Prime shipping or choose Subscribe & Save to get free shipping! No obligation to continue the Subscribe & Save! Just go into your Amazon account to cancel when you receive your first order! Don’t miss this deal at Amazon Today on the BIC Xtra-Precision Mechanical Pencils, Metallic Barrel, Fine Point (0.5mm), 24-Count for only $3.15!